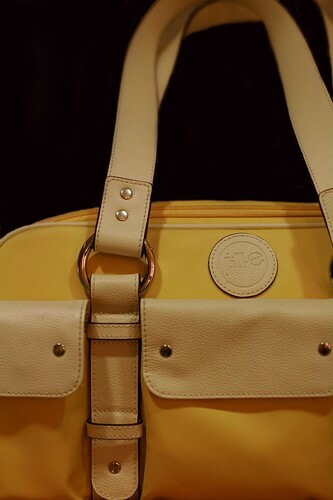 I'm grateful for my new camera bag! Since purchasing my new camera gear, I've been toting around something akin to a construction worker's lunchbox, practical but oh so dreary. So when I happened accidentally across the designer, Jill E's bags - designed for us FEMALE photographers, I jumped at it - and it's adorable. If anyone wants to pass my name on to her to be a spokesperson, I'm ready!!!! Love it love it love it!! I've been into purses lately and at first I thought it was a fabulous new purse. But a fabulous new camera bag is just as good, actually better, since it's what you needed! Oooh, super cute--the yellow is so happy and springy. I want one for my Nikon d40! What camera are you using, BTW? Is it a Rebel XT? Renee - it is a Rebel XTI - and that's what I love about it: people think it's just a purse, but oh, it's so much more!!! Cheers! It appears from doing a quick google on it, that not only are there quite a large variety of colours and sizes but that it has quite a funky lining! I know, oliver - I had a hard time choosing!!! Very nice! And it has that perfect professional and practical look to it. Glad you are investing in your "second job". "Can I try your shoes on?"